EarthBound’s E3 appearance is also briefly mentioned on this old page from 1995. There’s gotta be more than that, though, right? Does anyone know of any other E3 1995 videos or magazine articles or anything that mention or show anything about EarthBound? I’d think Nintendo Power had something, but I don’t have those old issues anymore. It seems like the game flew under everyone’s radars back then, I’m guessing it was overshadowed by the Virtual Boy and/or N64. Maybe it didn’t get enough E3 advertising, therefor not selling well in the states. But who knows. Maybe talk to some collectors, they may have a magazine or two about it. Very cool find though Mato. You’ve been making several articles in these past few days great work! I have a bunch of old video game magazines from this era, mostly issues of Nintendo Power & EGM. I’ll have to pull them out and scan them for Earthbound-related stuff one of these days. I distinctly remember NP giving it a ton of coverage overall, but i don’t specifically remember anything about E3 in particular. Beginners level RPG? Wonder if thats what it was actually billed as at the time, or if the magazine just thought the simplistic graphics just meant the game was easy. Thanks, Mato and Juanito! I was already wondering things like “did Earthbound ever appear on an E3?” and things alike. 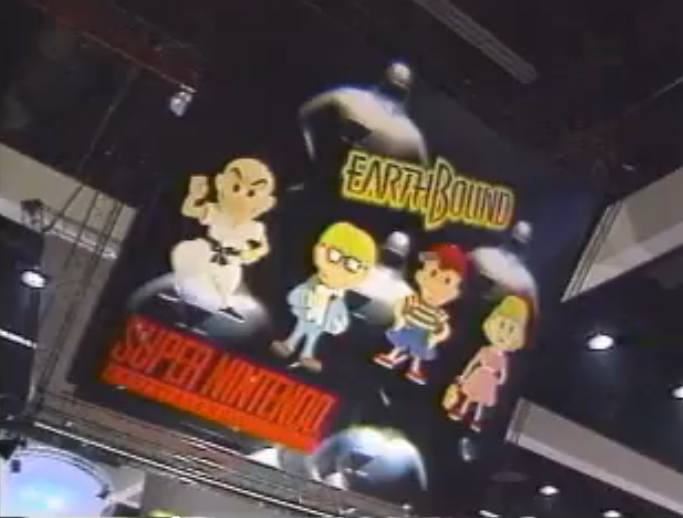 Nothing exceptional, but it’s another angle of the EarthBound banner. I guarantee you, something like that (one-of-a-kind) would sell in the thousands. It stands as one of the earliest pieces of EarthBound memorabilia (could very well BE the earliest) in existence! Where ever it is, it’s worth a jillion dollars at least. Wow, I was jesting about the value but after skimming the comments, some of you actually think like that:S.
E3 1995 was covered in the July 1995 issue of Nintendo Power. There is a brief mention of Earthbound and a photo of cardboard cutouts of the main characters. They look just like the characters on that display you posted. They had already covered Earthbound in the previous issue, June 1995, with an interview of Itoi and screenshots from the game with funny captions. Oh holy giygas, i wish i had been there. guys look at my blog! Is awesome. Well, E3 1995 would’ve been about a month before EB was released. So, less point promoting it? They show the “The War Against Giygas” screen at 2:53 in the video, too! Too bad that’s all they showed.